[MAKES FILING MUCH EASIER] It is so perfect for easily organizing cluttered papers in comfort. When you sorted files, you can see all of them. It helps you to quickly locate information and organize your files. 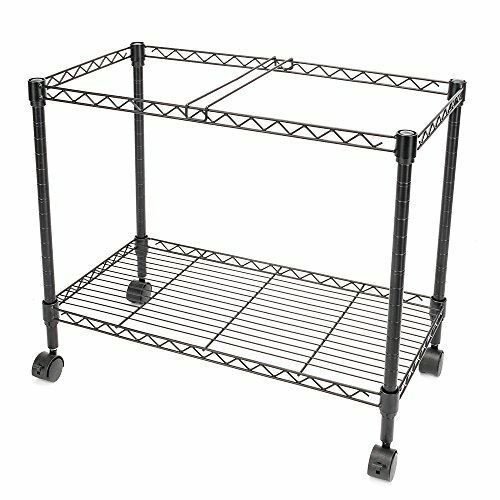 [EXCELLENT QUALITY]: Made of high quality steel construction, sturdy and durable enough to support up to 66lbs weight per shelf. [EASY TRANSPORTATION]: 4 swivel casters (2 standard, 2 locking). You can wheel it around easily, two of the wheels have locks on them when you don't want it roll around. [SPACE-SAVING]: It has a strong storage capacity for accommodate letter size and legal size file folders and it is short enough to fit under a desk, so it is space-saving that doesn't take up floor space. [EASY ASSEMBLED]: It is easy to assemble and required no additional tools.